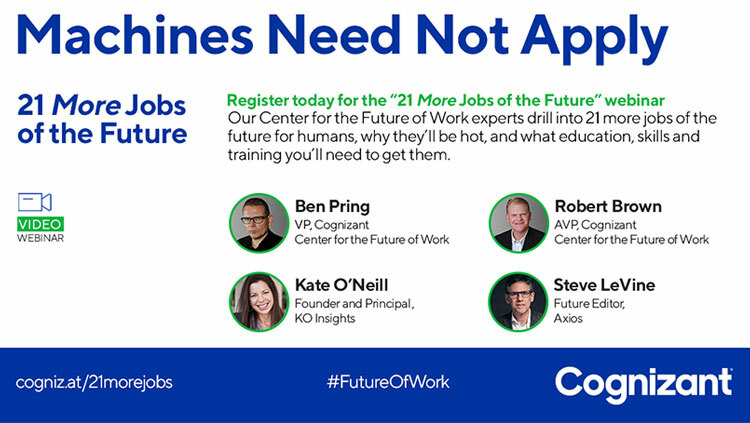 Cognizant - Perspectives: 21 More Jobs of the Future – Are you ready? This year, we present 21 more. Both reports espouse our argument that event as work is changing with the emergence of AI, humans have never been more integral to the future of work. The future of work is at the heart of every major socio-economic-political debate raging around the world today. All of these discussions – be they about walls across borders, migrants landing on the beaches of Southern Europe, surveillance policies in Xinjiang, hard or soft Brexits, taxi services in Paris or the concentration of wealth among the 1% – are rooted in the topic of the nature and distribution of work. From work, and what is derived from it – money – comes power. From its absence stems powerlessness. This long-evident truth is ever more real in 2018, precisely because people understand that work is changing more quickly than ever before. Given that the stakes are so high; the arguments are more ferocious. And the number-one reason why work is changing so quickly: the vista of technology opening up before us. A new digital prairie has appeared on the horizon, full of brilliant people solving unimaginably hard problems with brilliant technologies that are getting smarter and smarter, day by day. Many people are excited and energized by what they see emerging. Others are scared and afraid, frightened that what little grip they had on the economic ladder is about to slip.